Enhanced design compensator dramatically reduces recoil. Unique geometry minimizes muzzle rise for faster follow up shots. Side gas port counteracts barrel twist produced by projectile spin. Pre-drilled on bottom for pinning muzzle brake to barrel. 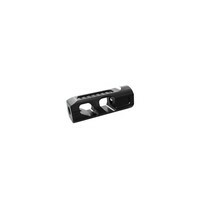 Designed to replace AR-15 muzzle devices with 1/2"-28 threads. Black nitride coating for durability in extreme conditions.